I did a lot of research for this article, both books and the internet. It was pretty difficult since much of the web-based information was in Spanish, and I can’t read Spanish. I apologize in advance for any errors in the text. I have a couple of motorcycles in a storage shed – there just isn’t enough room in the garage. One of them is a Ducati single with an unusual feature. I dealt with Ducsti singles quite a bit during the 1970s and was very familiar with the them. 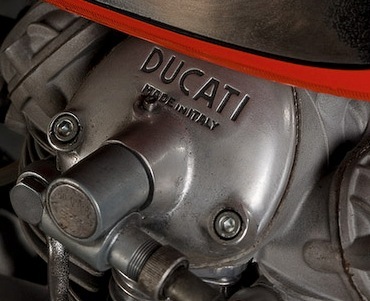 The top bevel cover had cast into it the word “DUCATI,” with smaller letters below it “MADE IN ITALY,” as shown in the photo here. Except the one in my shed has “MADE IN SPAIN” cast into the bevel cover. A little background: until 1972 Ducati made small single cylinder motorcycles, starting just after WWII. By 1972 they were making bikes in 250cc, 350cc and 450cc variants. That was also the year they introduced the 750cc GT, a twin cylinder bike. It was also the year of the fabulous and well-publicized 1-2 finish at the Imola 200 race, an event that established Ducati as a legitimate maker of large displacement motorcycles Mind you in 1972 750cc was a BIG motor. By that time the singles were sold in two variants, the blue and gold Mark 3 and the yellow-orange Desmo. They were produced in 1973 and 1974. After 1974 the Italian factory stopped making singles, concentrating on their larger twin cylinder models (there were a few singles made in 1978 to clear out the parts bins, but that doesn’t really count; neither does the Supermono, which was made in limited quantities for racing only). 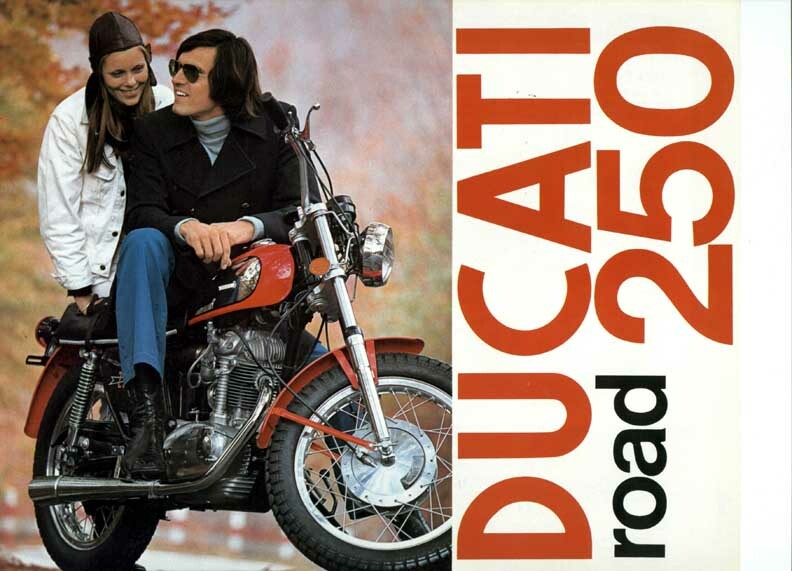 To many people the 73-74 models were the last and best of the Ducati singles. The Mark 3 (left) and the Desmo (right) Ducati singles of 1973-1974. Many people consider these the last of the Ducati singles, but that wasn’t quite true. Photos from Ducati advertising brochures. 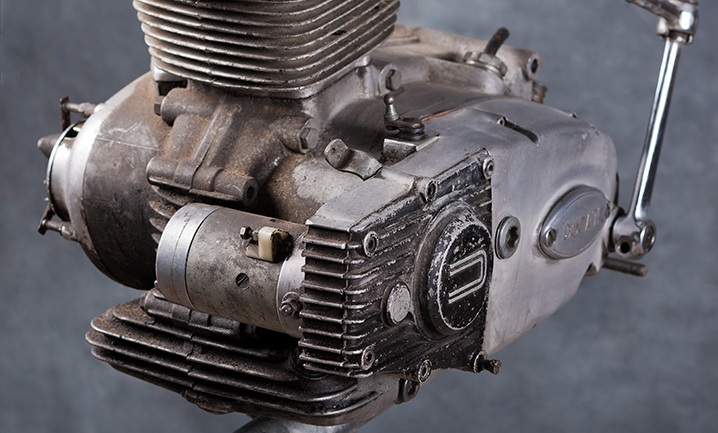 They were kick-start only bikes with outdated 6-volt electrics, an overhead camshaft motor with the cam driven by a tower shaft and two sets of bevel gears. They came standard with a 4-shoe drum front brake and twin shoe rear drum brake on 18 inch wire spoke wheels. For an extra cost the Desmo could be fitted with a single disc hydraulic front brake. The older Ducati singles fans already know about this – there were Spanish Ducatis made under license by a company called Mototrans, and they continued to develop and manufacture Ducati singles until 1983. 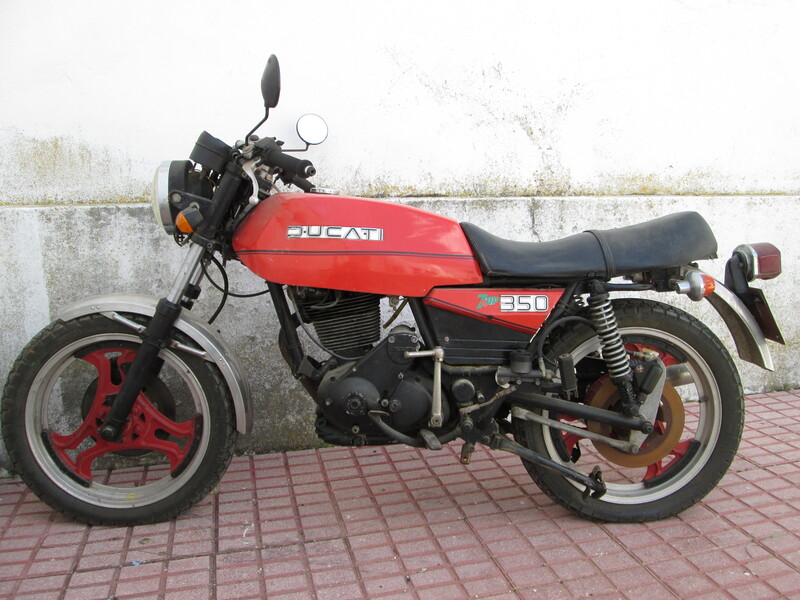 A few of these Spanish Ducatis were imported to the U.S.A. as the 250cc and 350cc Road models. How the Mototrans Ducatis got to the U. S. (and in my storage shed) is a strange story. In 1968 Berliner Motors abruptly refused an entire shipment of over 3,000 Ducati motorcycles they had ordered, as the bikes were not selling quickly. I can’t confirm this but I heard the bikes were already on the boat when that happened. They ended up getting re-routed to England which caused quite a disruption in that relatively small market, but that’s another story. However, Berliner’s stocks eventually got low and Ducati, understandably, was reluctant to build more motorcycles for them. Eventually Ducati and Berliner made up, but in the meantime a bunch of Spanish Ducatis were imported and sold in the U.S. The Berliner produced brochure for the Road 250 Mototrans Ducati. There was also a Road 350. Photo from http://www.ducatimeccanica.com. The Mototrans Ducati singles of the 1970s were generally considered inferior to the Italian models in metallurgy and construction. However, Mototrans continued to produce and develop the singles after the Italian factory stopped making them. There were three models of interest, the 250cc Strada (street), the 350cc Forza (force) and the 350cc Vento (wind). The Strada and Forza were “standards” with sit-up ergonomics and dual seats, like the Italian Mark3 models. The Vento was the café racer. Improvements? By 1974 Mototrans had already been using a snail-type chain tension adjustor and a reinforced swing arm. The Strada and Forza both had been upgraded with a single disk brake on the front, and a disk rear brake on the Forza. I don’t know if the Strada got a rear disk but I don’t see why not. All three bikes had been converted to 12 volt electrics, and I think they all had electronic ignition. All three had replaced the old hairpin valve springs with modern coil springs. A lot more work was done on the 350 Forza than the Strada, the most significant being an electric starter. The clutch cover was modified to allow a chain-driven starter mounted on the front of the motor. Here is a Phil Aynsley photo of the motor showing the starter and the extended clutch cover from an un-restored Forza. Those familiar with the Italian single engine may also notice the broader squared-off cylinder fins from the twin replaced the round fins of the Italian version of the single. The square slide Dellorto (Italian version) or Amal (Spanish version) carburetor had been replaced by the more up-to-date PHF 30 AS Dellorto pumper carb. More development attention was paid to the 350 Vento. It was the cafe-racer of the line, and featured clip-on handlebars, rear-set foot controls, and a solo bum-stop saddle. Eventually it was fitted with Brembo double disc front brakes and a single disk on the rear, with cast wheels. The carb was upgraded to a PHF 32 AS. The Vento never had an electric starter because Mototrans didn’t want the extra weight. The final result reportedly weighed under 300 lbs dry, made 28 bhp with a top speed near 100 mph. Phil Aynsley has a very comprehensive set of 20 photos of the Vento (including the above) at http://www.philaphoto.com/imageLibrary/thumbnails.php?album=981. Many people, myself included, were disappointed when Ducati Italy stopped making the singles. 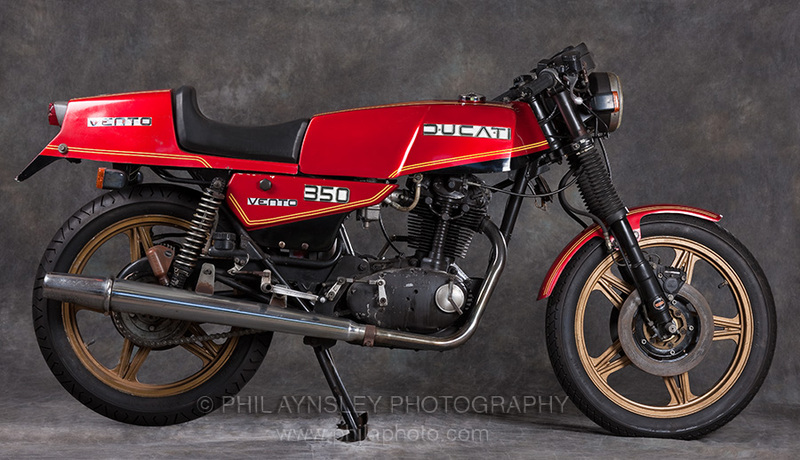 Ducati in 1974 was much smaller than it is today and they didn’t have the resources to continue development of the singles, but many feel that the Vento and Forza represent the direction development would have gone if production of the singles continued in Italy. Mototrans manufactured a few of its own motorcycles and scooters as well as the Ducati-based singles during the years it was in operation, 1957-1983. In the 1980s it fell on hard times and was bought by Yamaha in 1983, and production of Ducati designed motorcycles ceased.